What to do about Shamima Begum? Shamima Begum was just 15 years old when she left her home in Bethnal Green, London, to join Islamic State in Syria. Now, four years later, she has witnessed two of her children die of illness and malnutrition, and fears for the life of her third child, born in a refugee camp in Eastern Syria, from where she’s requested to return to the UK, having shown no remorse for her dealings with ISIS. The ‘punishment’, if we can call it that, is to strip of her of UK citizenship, which the Home Secretary can only do in this case because he believes Begum has the right to apply for Bangladeshi citizenship, even though she has never visited Bangladesh. Interestingly, the UK government isn’t simply allowed to strip an individual of their citizenship and render them stateless, they are only allowed to do so in begum’s case because her Bangladeshi heritage allows her to apply for citizenship there. However, the Bangladeshi authorities say she won’t be allowed in. This article in The Conversation provides an accessible insight into the legality of revoking citizenship. Even if the UK government is legally allowed to strip Begum of citizenship, this still feels like the UK government is somehow denying responsibility for Begum – surely it would be more appropriate to bring her back to the UK, put her on trial, and actually punish her as the UK citizen she really is, rather than trying to revoke it. The argument that she’s ‘our responsibility’ is rooted in the fact that she was radicalised in the UK and managed to leave without any effective ‘safeguarding intervention’. What the UK government’s response shows is just how difficult it is for nation states to deal with such international criminals…. Maybe it’s because we’ve got no long-term solutions? Maybe the government doesn’t want to bring her back because the population would be so against it, as 78% of the population believe she should have had her citizenship revoked. This could very well (probably is) an example of popular punitiveness, despite the fact that she’s not really being punished as such! However, just passing the buck onto another country because of a legal technicality doesn’t seem right, and what kind of message does this send out about how to deal with international criminals more generally? Whatever your opinion on the Shamima Begum case, it certainly illustrates a the problems of dealing out justice where international crimes which cross boarders are concerned, and maybe suggests that nation states are too small to deal with such criminals? Maybe we need to take a lesson from Escape to LA? Rather than nation states dealing with them in country of origin, we just put by stateless regions on earth, and build a wall round them, and see how they get on…? We could also film it with drones and turn it into a form of entertainment….. the scary thing is this doesn’t actually sound that far-fetched, I can actually see most people getting on board with the idea! 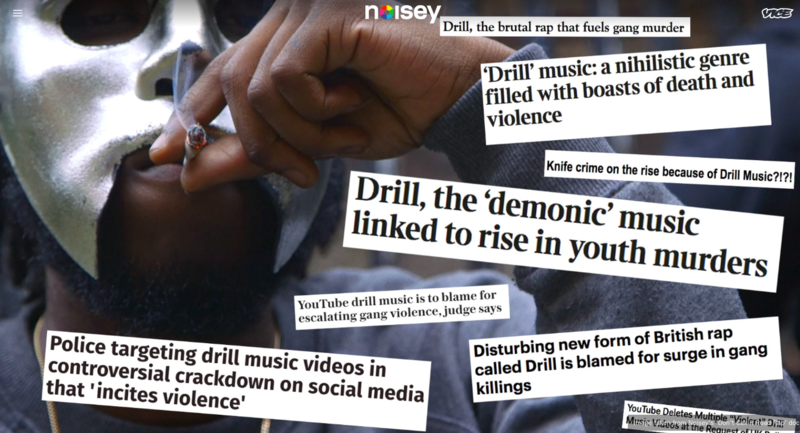 Jailing Drill Musicians – justified, or a moral panic? In January two ‘drill’ musicians from the Brixton group 410 were effectively jailed for playing a particular song: ‘Attempted 1.0’. Two artists from the group, Skengdo and AM, both received 9-month suspended sentences for performing this song. It’s still up as of 20th Feb…. I don’t how much longer it will remain up, but while it does it’ll give you a pretty good idea of what the authorities may have deemed to offensive: the strap-line for a start… ‘attempted… should’ve been a murder’ and then all the various references to guns and people getting knifed. The problem is, by performing this song 410 weren’t technically engaged in an illegal act. The laws preventing inciting of violence only apply to specific acts, and this is not the case with this song. The two artists were actually found guilty of breaking a criminal behaviour order (CB0) that had forbidden them from mentioning death, injury or rival drill crews in their songs. The nine-month suspended sentence is for breaking the CBO not inciting violence, which they weren’t technically doing by performing their song. The authorities have criminalised this non-criminal act for these particular artists. This is a good example of a ‘right realist’ policy in action – In fairness to the authorities, there has been a recent increase in knife crime, and this is all part of the response to that. I imagine most of the public would agree with this harsh treatment. And it’s fair to say that some Drill songs which have been put up on YouTube do have specific references to gang’s ‘score cards’ and specific knife and gun and attacks. So there is a real basis for all of this it’s not just hyperreal. However, it also relates to the labelling theory of crime – here we have a legal act (performing a song) which is turned into an illegal act for this specific band by the actions of the authorities. Maybe this is an unnecessary moral panic about this form of artistic expression? What ‘blaming Drill’ for the increase in knife crime fails to take account of is all of other underlying factors which result in inner city violence – such as funding cuts, relative deprivation, poverty, and structural inequalities which stretch back to the 1980s. – Banning violent video games? – Preventing campaigners discuss poverty and inequality? It’s highly unlikely that Criminal Behaviour Orders are going to be used to stop people spreading Fake News or Politicians lying to us. Vice – A nice article on the moral panic over Drill. In this post I consider a ‘top band’ answer (both are provided by the AQA here) which achieved 10/10. NB – If you would like to attempt this question BEFORE looking at the full mark response below, then you can review the topic first by clicking here >>> ‘Is sociology a science?‘. Interpretivism is the view that sociology is not a science. Interpretivists argue that, because humans think and reflect, scientific methods are inappropriate as they do not allow us to truly understand and dig beneath the surface of behaviours and actions. Unlike objects, which can be analysed using scientific methods, Interpretivists argue that human beings change their behaviour if they know they are being observed, called the Hawthorne Effect, therefore if we want to understand social action, we have to delve into meanings using qualitative, unscientific methods. Interpretivists are subjective, meaning science is not appropriate for sociology in their opinion as it gives objective results and data. Interpretivists argue that the purpose of sociology is to understand human behaviour, no quantify it using scientific methods, therefore it cannot possibly be a science. If you’re freaked out by the above response, don’t be: if this wasn’t written by an examiner, it’s written by an outstanding candidate. Students typically find this topic one of the most difficult, and most answers will come NO WHERE NEAR this standard. Technically, I don’t think the last sentence should get any marks, because it is not focused on the actual question.